Grilled goat cheese with cranberry preserve and toasted bread – Tasting the World – On the road, with stuffed hand luggage and face. Camera in my hand. You know that feeling. You come from work, want to eat something, but don´t feel like spending too much time preparing the dinner. On Tuesday that was my case. Let me share with you one quick dinner/snack tip that will save you some time. It´s nothing groundbreaking, it´s so simple that it´s actually not even a recipe, but it´s sooo good! 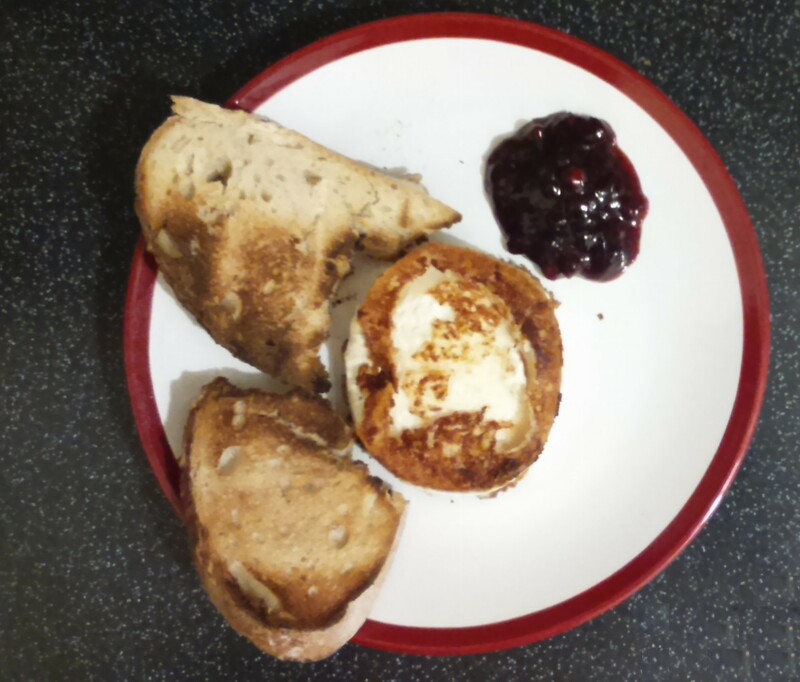 As you can see on the picture, it´s grilled goat cheese with cranberries preserve and toasted bread! The method couldn´t be easier. Put the cheese on a pan or grill and let it grill for a few minutes from both sides. Toast a slice of bread. I used the bread I brought from the Czech Republic, but the choice is yours, use which one you like. When the cheese becomes soft and when the crust appears, it´s done. You should be able to tell easily when it´s ready. The right moment also depends on you how crusty or runny you want the cheese. By this time the toasts will be ready as well. Now just put some cranberry preserve on a plate, add the sizzling cheese, collect the bread and dig in! If you think this wouldn´t make a whole dinner, just add one or more slices of cheese and bread. It´s not only a quick dish, it´s also cheap. I bought my cheese in that “Reduced to Clear” aka eat quickly section for 65 p. You can check the regular prices here. One portion still wouldn´t cost more than 2 GBP. A 200 ml jar of cranberry preserve is 2,50, so one serving would be approximately 30 p. Bread – let´s say 20 p a portion. So you end up with 2,50 GBP for tasty dinner, maybe 4 – 5 if you´re really hungry. You can also substitute the goat cheese with any camembert type of cheese. What are your favourite quick dinners? This is my contribution to the Tasty Thursdays blog event.